Summary Statement is the last section of your CDR report which is required in the Migration Skill Assessment process of Engineers Australia. The CDR report acts as a demonstration of the core technical skills of the applicant and how proficiently the applicant can apply those skills in their engineering field. The summary statement, as the name suggests, is a sum up of the career episodes mentioned in the CDR. 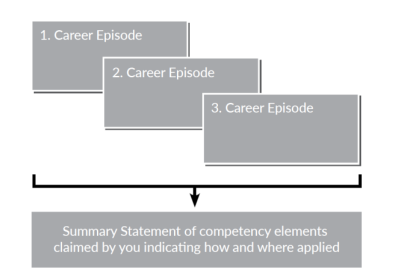 The applicants have to analyze their career episodes and hence provide a cross-reference in the summary statement to the particular career episode paragraph. To make the summary statement writing process straightforward for you, this article will provide you with some summary statement examples and samples for your reference. First of all, you must understand the format of the Summary Statement. You should understand that it is an important part of your CDR as it makes the assessment process easier. The Engineers Australia provides the guidelines for preparing the summary statement in the Migration Skill Assessment Booklet. The summary statement is created in the form of a table. For each occupational category, the engineers Australia has provided certain competency elements. These competency elements further have certain competency indicators associated with them. The applicants have to analyze the achievements and roles that they have mentioned in their career episode matches with which indicator and hence provide the relevant explanation of the same. It may happen that they may not be able to cover all the indicators. Consider the Summary Statement template for Engineering Technologist provided by Engineers Australia. Knowledge and Skill Base – In this section you can represent your knowledge and abilities that you possess about your engineering field and thereby provide evidence point from your career episode. You should try to cover at least two indicators form this section. Engineering Application Ability – In this section you have to represent your engineering capabilities and how you have actually applied your knowledge in the engineering field. You should try to cover at least three indicators form this section. Professional and Personal Attributes – In this section you not only demonstrate your engineering abilities but your personal traits such as work ethics and communication abilities. Now consider the professional engineer summary statement sample. 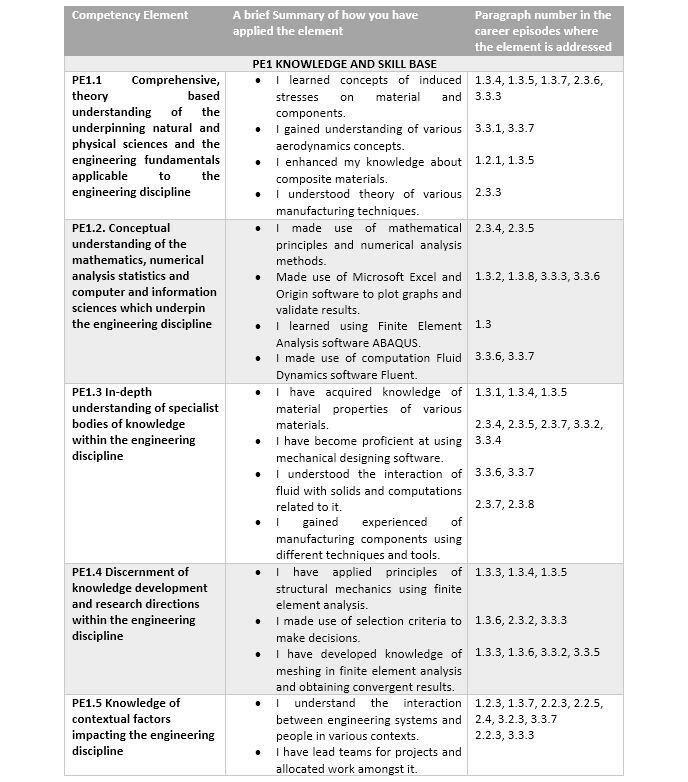 You may see how they have explained the competency elements and have also indicated the career episode paragraphs in the last column. However, this is not the complete statement. Summary Statement completely depends upon your Career Episodes. Therefore, make sure that you have prepared the Career Episodes in the right way. Before starting with the summary statement try to go once again through your career episodes and see if they are in relevance to the Migration Skill Assessment requirements by Engineers Australia. Another important thing about career episodes is that you must mention them in paragraph form and name the paragraphs, for instance, CE 1, CE 1.1, CE 2, CE 2.1 and so on. In this way, it would become easier for you to indicate the cross-reference as well as it would be easier for the assessor to match the indicators with your career episodes. Analyze your career episodes keenly as many times it happens that the applicants are not able to understand the relevance of an indicator and they match it with an incorrect paragraph in their career episode. This, on the whole, makes your summary statement incorrect and hence can lead to rejection. Therefore, pay attention to every little detail of your career episode and understand the competency indicators well. It is not a compulsion to keep your summary statement to one-page length. Make sure you provide a summary that reference to all your career episodes. You do not have to mention a lot of details but make sure you do provide a good explanation against each competency indicator you choose. Last, but not the least, consider some summary statement samples for Engineers Australia before writing your own summary statement to get an overview of how to conduct the analysis and match the competency elements.